Following is the programme for "Ooh la-a! Jacques' Back!" on August 2, 2001, at 1.10pm and 8pm in the Christchurch Town Hall auditorium, New Zealand. The notes were written specially for the concerts by Martin Setchell. Alf was just the sort of fun guy who would have smiled at his Sortie being used as an Entrée as well! His parents obviously had a sense of humour too, because with all those names, they ran out of space on the baptismal certificate.He enjoyed life to the full, so he couldn't see what was wrong with entertaining his congregations at the Madeleine with the popular music of the day which they had heard the night before at the ballet or the Opéra Comique. The Parisians loved him, and he enjoyed an illustrious career both in France and throughout Europe. Rossini came specially to hear his legendary 'Storm' improvisations, and he had the honour of playing for Chopin's funeral in 1849. Cavaillé-Coll, the famous organ builder, was a shrewd businessman, and when he needed an organist to show off his latest instrument with a few fireworks, whom did he call on? You've guessed it - our Alfred, the Virgil Fox of his day. Sadly his time came all too early; at the stroke of midnight on New Year's Eve 1869 he died at the organ, just after playing the sortie for the Midnight Mass. Luckily for him they'd held the party beforehand. With his pince-nez spectacles, side whiskers, watch chain and rather haughty look Dubois would not have been out of place in an English Victorian drawing room, especially as he'd have been called Francis Wood. 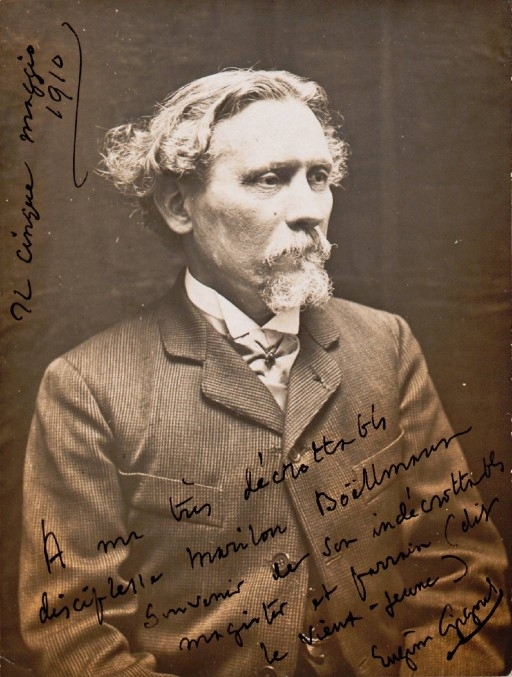 He was the establishment figure who played things by the book, studying at the Paris Conservatoire, winning the First Prize for organ in 1859, and the coveted Prix de Rome for composition in 1861 (which allowed him a cushy 2 years' holiday in Italy). Later he became professor of harmony, then of composition, and finally secured the top job of Director. Ultra-conservative, he even forbade his pupils to see Débussy's Pelléas et Mélisande, because he thought it would damage them morally. After such an impeccable track record, he got quite a shock one morning in 1914 when he read his own obituary in several reliable European and American journals. Someone was clearly trying to tell him something. So for the remaining ten years of his life, first thing every morning he would scan the obituary columns, and once he'd assured himself he wasn't in them (and decomposing), he got up (and started composing). Franck's parents were obviously determined to outdo Lefébure-Wély's by baptising him with so many names that the priest demanded overtime. Naming him after the great Roman Emperor just shows how determined they were to exploit his musical talents so his Dad could retire early from the bank, but unfortunately their efforts to launch him as a concert pianist failed miserably, and poor César ended up working all hours to clear the huge debts. By this time he must have been kicking himself for showing off in his first year Conservatoire exam by not only playing the sight reading test perfectly but transposing it down a minor 3rd as well. Being more German than French of course, Franck was a serious thinker and he wasn't interested in the popular style of organ music. Rumour had it he even liked Wagner! Most of his music is intense, devout even, so much so that one of the clergy at the unfashionable backwater church of St Clotilde where he became organist remarked: "Ah. M. Franck was very boring! He always played as though he were dead tired. But M. Dubois - he delighted us!". Still, his improvisations were so amazing that when he became Professor of organ at the Conservatoire the composition students used to drop in on his classes to learn how to compose at the keyboard. He loved changing keys so much that one called him 'Une machine à moduler' (a modulating machine). 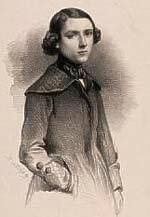 Another pupil defied him by refusing to budge out of C major - a young rebel called Débussy! But most of his students, like Vierne adored him and dubbed him Pater seraphicus. So they were all heart-broken when their absent-minded Father-Professor, shabbily-dressed with his coat a size too big and his trousers a size too small, died after a street accident with a horse-bus. So much for stable thinking. . .
Gigout had an unhappy life; people used to misspell his name on purpose as 'Gigolo' or 'Gigot' (= mutton-leg). He couldn't argue when they called him a "Nancy boy". And with only one forename he couldn't possibly compete with his fellow organists who boasted three or four. 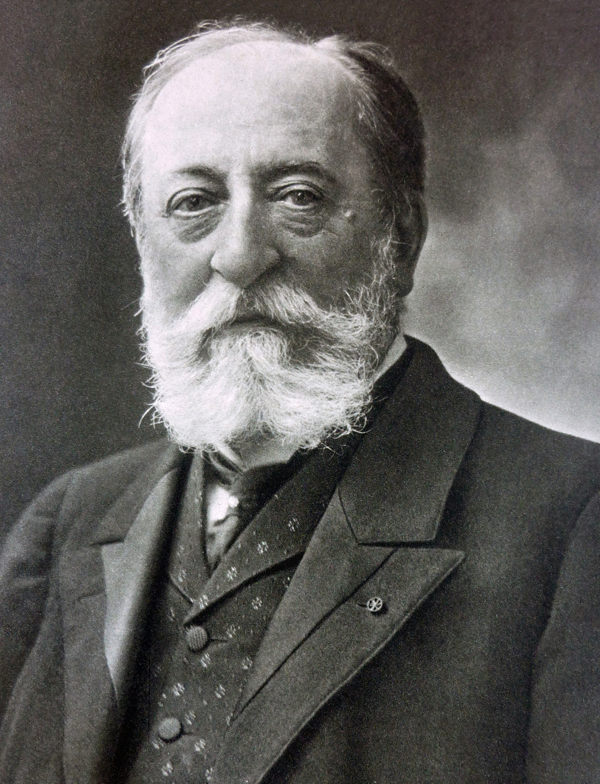 He studied at the Ecole Niedermeyer under Saint-Saëns, and later secured himself a teaching job there by marrying the boss's daughter. The job he was really after was the Professorship of organ at the rival Conservatoire, but this went first to Widor, and then to Guilmant. When he finally got the job in 1911 he was nearly 70, and couldn't remember why he'd wanted it in the first place. Poor old Vierne. It seems life dealt him one rough hand after another. He was born blind and despite treatment, never gained more than very foggy vision. A bad fall nearly resulted in his right leg being amputated, and he suffered variously from bronchitis, typhoid, glaucoma, and a weak heart. His desk was full of potions, tranquillisers, and sleeping pills. True, he landed the most famous cathedral organist's job in the world, but even this meant turning down a more fashionable parish which would have paid twice the salary. His wife ran off with an organ builder after ten years of marriage. He lost his father when he was 16, and his first son, aged 10, then his second son and brother René were killed in action in World War 1. He was very nervous and suffered agonies with stage fright. Financially, he was also a bit of a loser, though he cashed in bigtime by deferring his concert tour to the States and Canada until 1927, by which time the US dollar was worth 25.5 francs. No wonder the console was his console. His end typified his life. 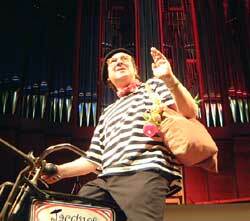 Unable to finish his 1750th organ concert he fell dead on the pedalboard just before the interval. Ironically, the clergy had already told him it would be his last concert at the cathedral which would, from then on, be reserved for liturgical purposes. And yet, he was kindness personified. It just couldn't have happened to a nicer guy. The minute she found baby Camille could recognise the kettle as boiling in the key of A, Madame Saint-Saëns knew she had a child prodigy on her hands. Sure enough, he learned the piano at the age of 2 and a half, was reading and writing music at three, composing at five, and performing at eight. Pretty nauseating, really. Worse still, he grew to be a genius gifted in everything. It wasn't just that he was famous throughout Europe as organist, pianist, composer, and conductor; he was into astronomy, archaeology, the sciences, literature - you name it, he excelled in it. No wonder he got invited to all those society dinner parties. Yet as a person, he was eccentric, capricious, and renowned for his irritability and bad-temper. Who else could have proposed marriage by writing to his intended's brother to ask if he would like to become his brother-in-law, or suddenly given his young wife the slip on holiday a few years later, never to see her again? He was popular in England (Queen Victoria WAS amused by him), had streets named after him, statues erected to him in Paris while still alive, and apparently enjoyed his own state funeral. Died December 1921, Algiers, aged 86. Guilmant managed to avoid actually living in Paris for the first 34 years of his life; he was perfectly happy helping his Dad build organs in Boulogne, playing at his local church, and enjoying the open-air life on the coast. When he did move to the city to become organist at La Trinité he had to manage in a poky flat, and since the church wouldn't let him use their organ for teaching he had to be content with a small house organ he'd built. Luckily for him, Paris's first concert hall organ - a magnificent new Cavaillé-Coll in the Salle des Fetes, Trocadéro Palace - opened in 1878. From then on he spent his time pulling the punters in their thousands to secular organ concerts, both there and all over Europe and America. He gave up his church job when he found the clergy had gone ahead with alterations to his organ while he'd been away on tour, and got the work done cheaply but very badly, without him even knowing. So he moved out of the city and built his own villa in a small picturesque village, a few kilometres out of Paris, where once again he could enjoy the country life and play host to thousands of visitors and students (provided he wasn't on tour; if he was, he figured they could always amuse themselves enjoy walking round the gardens or chasing one of his many daughters). With Guilmant as his mentor, and a whole array of forenames covering all eventualities, there was no doubt Bonnet would go far. 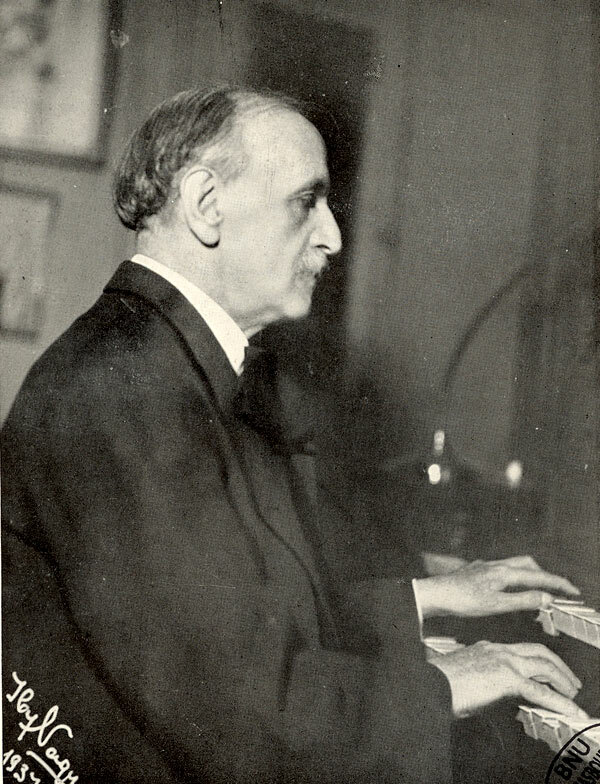 He was soon off on an American tour in 1917, and sure enough he received rave reviews as a concert organist, being compared to Paderewski and Kreisler (since nobody had everheard them play the organ he was perfectly safe). Being interested in old French, Italian and German music he enjoyed giving Historical Organ Recitals of music by early composers, whose names had gone down in history (and down, and down and down...). With things not looking too good for France in the early war years, he decided to quit while the going was good. He went further than ever; this time to Canada, where he founded an organ class at the Montreal Conservatoire. It was much more peaceful there, and they could speak French, so he never saw Paris in the springtime again. So Widor got on and enjoyed life as organist, composer (not just of organ music but symphonies, ballets, songs and chamber music), writer, conductor, teacher and eventually cultural ambassador for France. He was a bit of a dandy sporting an elegant blue suit, spotted cravat, soft hat and cane. When he took over as Professor of Organ at the Conservatoire, Vierne and the other pupils got the shock of their lives when the dowdy old Franck was replaced by something out of Paris a la mode. He ate well, savouring the gastronomic delights of his favourite restaurant at Foyots, and welcoming eminent visitors like Dumas, Albert Schweitzer, and Busoni. He drank well. And women? Well for years he was the most eligible bachelor in Paris. He had so many women in the organ loft at a time that in the end the Archbishop of Paris forbade him any female visitors at all. That is until at the ripe young age of 76 he was doing a spot of overtime one Sunday, when he met and later married a young woman half his age. The Town Hall Auditorium, Thursday night, August 2. Alias Martin Setchell, Jacques arrived at the auditorium stage on a grocer's bicycle during a performance of the Sortie in E flat by Lefébre-Wély. We are told that Lefébre-Wély died while playing this work at a midnight mass, so Jacques, having made his way to the organ console, arrived just before the final chord, which he deftly played on the Town Hall Rieger organ. This was the start of a performance that was distinguished for its musical excellence and humour. The playing of Martin Setchell were consistently of a high order, and the Director of the performance, Yvonne Martin, had arranged a continuity and script that was dignified, informative and, above all, fun. Amusing features and incidents were extracted from the colourful lives of the composers, and woven into a script which Jacques spoke in his introductions to the items of French organ music from, mostly, the late romantic period. All the composers were themselves leading organists, mostly in Paris, and Martin Setchell took the moderate-sized audience through a programme of some of their best compositions. Dubois, Franck, Gigout and Vierne provided the music for the first half of the concert, culminating in Vierne's resplendent Carillon de Westminster. The second part took us through pieces by Saint-Saens, Guilmant and Bonnet, before concluding with a Cantabile, and the famous Toccata from the 5th Symphony by Widor. Jacques must have been suffering from some exhaustion by this time, but rather than dying while playing his last concert, as more than one great French organist had done, his signs of degeneration took the form of starting the Widor Toccata upside down. Unfortunately, the time taken in correcting his false start meant that the cleaners, alias Pandemonium, had to start their work before he had finished. So carried away they were with the music that they added some lively percussive accompaniment with such implements as broom handles, water glasses and a well-tuned rubbish tin.